Good morning! Snow has finally started across parts of Central Alabama this morning. It will snow for a couple of hours in places like Gadsden, Birmingham, Oneonta, and Tuscaloosa and some places will pick up to one inch of snow. The entire band of rain will gradually fill in with snow as it takes on more of a north-south orientation. Most spots will see about 2 hours of snow. 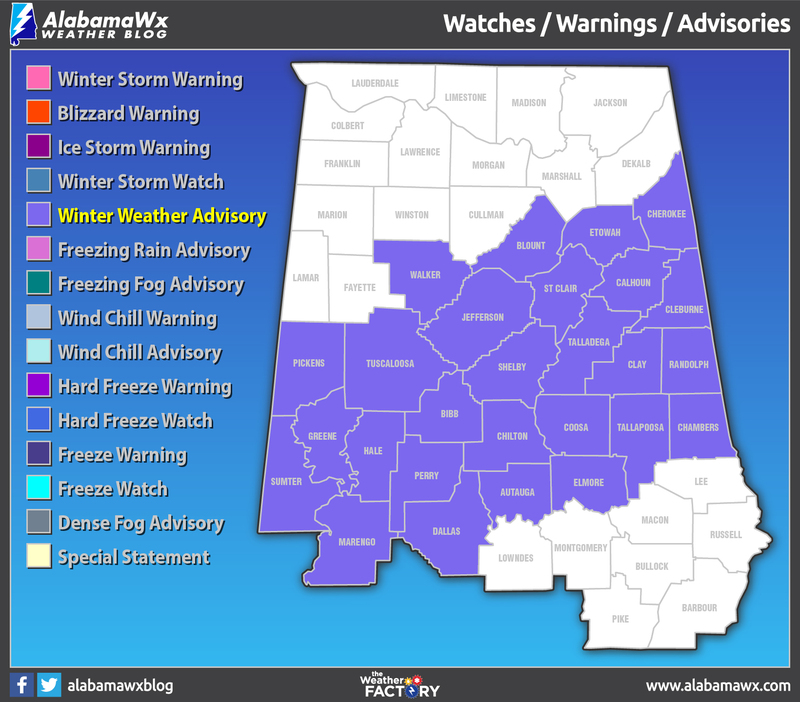 WARNING CHANGED TO ADVISORY: The winter storm warning has been changed to a winter weather advisory for Central Alabama. Counties from Washington up through Monroe, Dallas, Autauga, Elmore, Tallapoosa, and Chambers counties up to I-59 are under a winter weather advisory. The advisory has been canceled for Marion, Lamar, Fayette and Winston Counties. The winter storm warning has been canceled for the Tennessee Valley counties of North Alabama. TEMPERATURES: Temperatures are dropping along I-59, but fortunately they don’t hit freezing until after the precipitation moves out. DRIVING CONDITIONS: So far, roads have been just wet and the snow has ended before temperatures reach the freezing mark. But watch for a few slick spots mainly on bridges this morning. TEMPERATURES DROP TONIGHT: The airmass has modified We will still need to be a little cautious during the late night and overnight hours for icy road conditions but not as big of a problem as first expected. WEDNESDAY IMPROVEMENT: Temperatures will warm above freezing by mid-morning tomorrow and will combine with more sunshine to improve road conditions. HIghs on Wednesday will top out in the lower 40s. 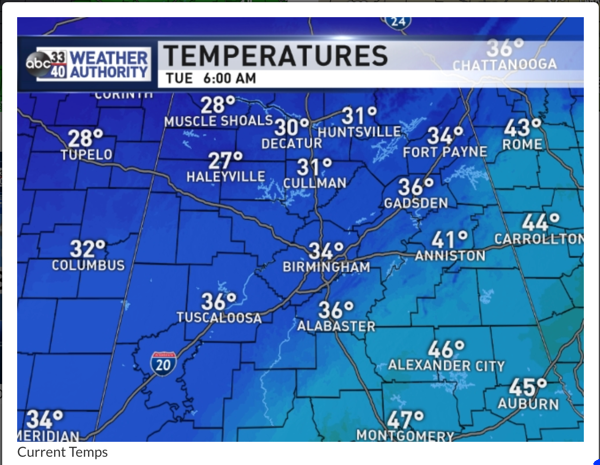 THURSDAY MORNING EVEN COLDER: Teens will be prevalent Thursday morning as the coldest part of the airmass settles into Alabama. But afternoon highs will approach 50F. NEXT PRECIP: A few showers may show up Friday evening, but they should be mainly to the northwest of Birmingham. Showers will be possible from Saturday afternoon through Sunday, but it could be mostly dry for us. Looks like the local groundhog, Birmingham Bill (no relation) will see his shadow early Saturday morning. WEEKEND WARMUP: Look for highs in the middle and upper 50s Friday and to return to near 60F on Saturday. NEXT WEATHERMAKER: Rain will return early on Wednesday, but it will be another quick hitting system. Colder air will follow for the end of the week. VOODOO COUNTRY: Looks like another system with decent rainfall amounts and some thunder will arrive for Saturday the 9th. More storms arrive on the 13th. No more snow showing up for now. ON THIS DAY IN 1936: Birmingham was experiencing its second-biggest snowfall ever. It snowed for 24 consecutive hours and when it was over on the morning of the 30th, 11 inches of snow was on the ground.